The beginnings of our new season garden. From the outside, our simple house belies the fact that such rich lives are being lived here. You can see and feel it in the backyard with the abundance of life evident there, but at the front, well, our small home looks like many others dotted endlessly throughout the urban and rural areas of Australia. But Hanno and I have found the secret of living well and we are developing the art of it every day. It took that break away from blogging for me to step back and look at what we've got here. Our lives are not just skin deep, there is real depth here. 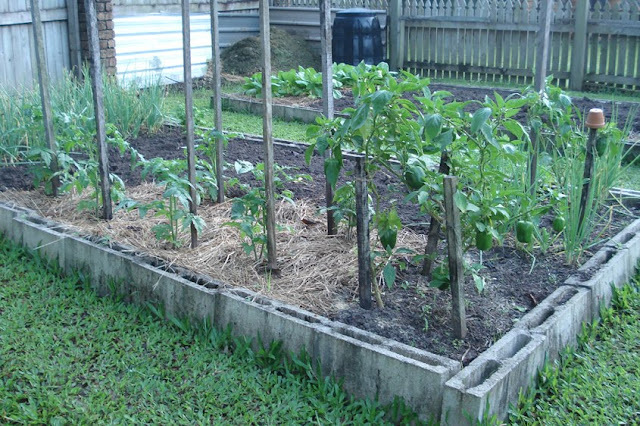 Tomatoes, capsicums and green onions. Taking a break from this blog, even though it is a familiar friend to me now, helped me step back and take in how our lives here have evolved and shaped us. During my break I made sure I slowed down. It's one aspect of this simple life that I always need to readjust. Swiftness and efficiency often take over from slow and mindful, especially on work days and when I'm away from home. I need to slow myself back down again, put the brakes on and remind myself that work done slowly and mindfully easily gets through the chores and there is no stress at the end of the day. Here is my main gardener, Mr Hetzel. So while I've been away, Hanno has been working on the garden and I have to tell you that the soil this year is the best it's ever been. From almost empty beds just a few short weeks ago, we now have cucumbers nearly ready to eat, capsicums (peppers), lettuces, tomatoes, bok choy, beetroot, radishes, sugarloaf cabbages and green beans. 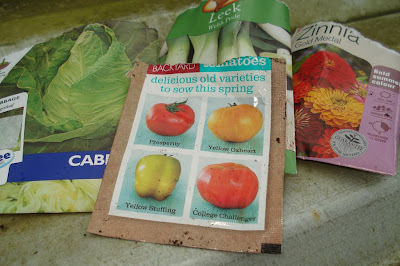 In the bushhouse, we planted seeds for leeks, tomatoes, more sugarloaf cabbages, silverbeet and those wildly mad zinnias that bring bright colour to the garden. The zinnias are ready for planting now, the vegetables need another week or two. 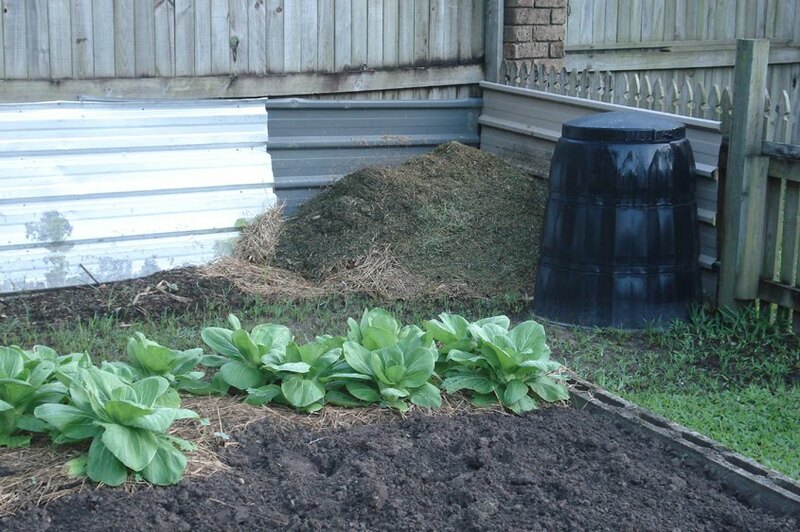 Bok choy growing fast in front of grass clippings waiting to be made into compost. Inside our home I've been knitting Hanno a jumper (sweater) and am just finishing the back. I hope to have him in it by June. I've also been reading new books and re-reading older ones, especially the wonderful Simple Living by Frank Levering and Wanda Urbanska. I read it several years ago but I'm enjoying it more now because I understand, from experience, what it is they hoped to do and how they fashioned their lives to suit themselves. I also have The New Compete Book of Self Sufficiency by the late John Seymour, sent to me as a blog giveaway by Steel Kitten, that I'm enjoying a lot. She actually sent two copies because the first one took months to arrive and she immediately ordered another copy when I told her it hadn't arrived. Naturally, when one turned up, so did the other. Thank you, Sarah. And thanks to everyone who sent a comment about my return. It gives me a wonderful feeling knowing that I'm welcomed back and have been missed. Yes, it came back again. 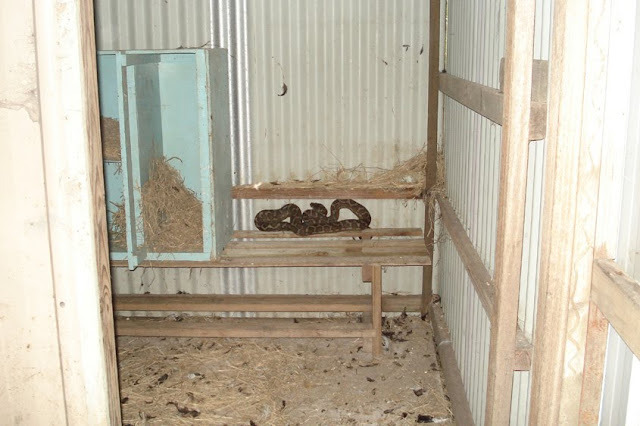 It was hiding behind the nesting boxes. The chooks are healthy and happy, even though they had another visit from that snake. Alice is doing well, despite her old age and ill health. Things are starting to settle down at my voluntary job and I imagine that in a month or so the slow rhythm of my days will return there as well. 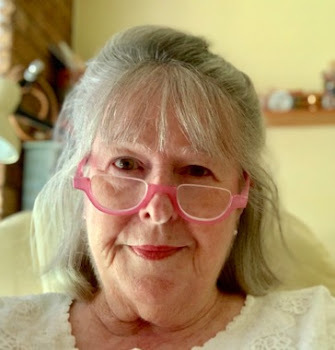 I've rearranged and stopped a few things I was doing so that now I feel quietly confident that I can keep up my home duties, work in my community and at a couple of little jobs and get everything done that needs doing. It's a good feeling knowing those tasks I've set myself will be carried out as planned. I do not need every day to be a good one, but I do need to know that I have done my best everyday. 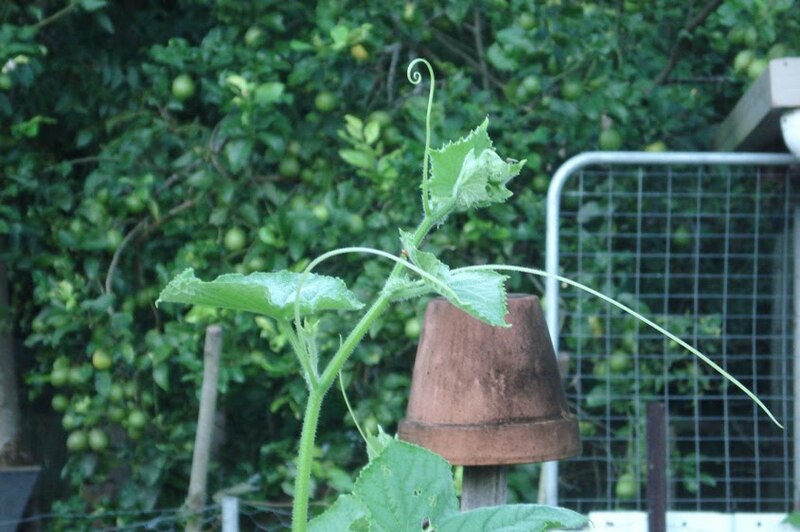 Cucumber tendrils have grown higher than they ought. In the background is a lemon tree with about one hundred lemons growing fat and juicy. I remember when I first stopped working for a living, one of the things I hoped the days ahead would hold was richness. I was not seeking richness in a monetary sense but more a life that was multi-layered, that built on its foundations and add layer upon layer the kind of work that would result in an unusual life by today's standards as well as a rich and rewarding one. Tick. Some of the seeds we planted. The zinnias will be planted out today. There is nothing better than waking to a new day that you know will be full of productive and interesting work around the home. 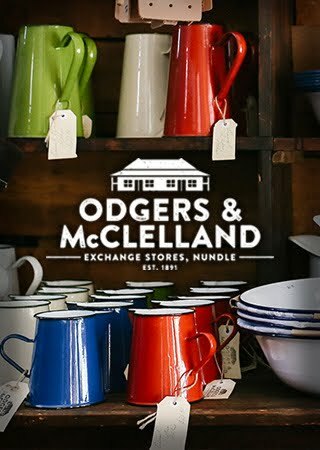 Pottering with this and that, putting things right, cooking, gardening, baking, sewing, sitting and thinking - all the things that went into old fashioned lives and not so much into those that are modern. Those things, to me, make a perfect day. And the truth is these days are so easy to home make. All they require is a commitment to one's self - a promise to stay true to our values and to live as we wish, not part of an homogeneous crowd, but as individuals who think about how we live. I do not need many of those perfect days to keep me going, just the promise of one tomorrow or next week is enough. And enough is all I'm after. I've been spending a lot of time thinking, relaxing and reading. I love blogging, it helps me live life in the way I want to live it, it helps me define my days and identify goals and new opportunities to learn. I can't imagine giving up blogging but there may be changes in the way I do it. But the main news I want to pass on to you today is that I've missed being here, I'm ready to come back, and I'll be here again tomorrow. 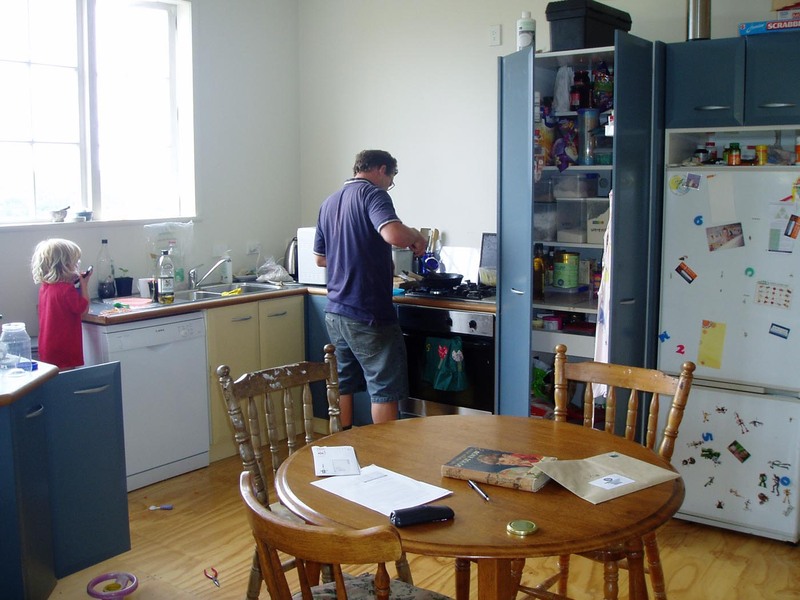 Today's kitchen is in New Zealand and it features real people living real lives. This is Charlotte's kitchen. "My name is Charlotte (aka ms lottie of theslightlymadquiltlady.blogspot.com), and I live on a lifestyle block in Northland, New Zealand. I decided to send in my photos, but leave my kitchen in its ‘in use’ state. 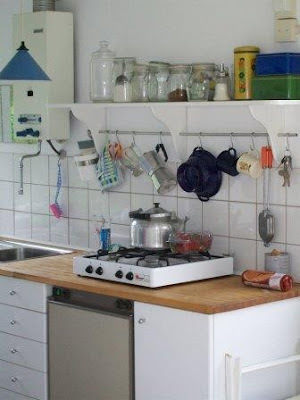 To send in pictures of it tidy would be a bit of a fib – it never stays that way for more than five minutes! The photograph of my sink includes my little girl. My sink is often used for these sorts of “Mama Tasks”. This time it was washing off the nappy cream she had found and smeared all over herself. We are living in a converted shed out on our block of land whilst we build a house (it’s taking a while!). 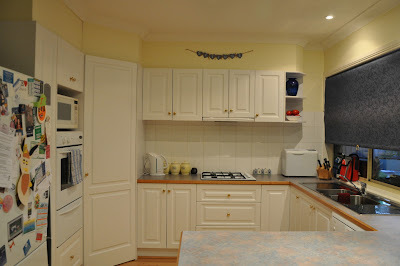 We needed a kitchen so we found this one second- hand on Trademe (similar to Ebay), we plonked it in and it works for us. The kitchen table and chairs are hand-me-downs and my husband is cooking in my best-ever opportunity shop find, a large cast iron skillet. Even the breadmaker that is chugging away on the bench beside him used to be my brother’s! I made the decision at the end of last year to stop my work as a midwife and stay home. I now intend to spend much more time in my kitchen, so I’ve recently been looking at it with new eyes, trying to organise it a little more and make it efficient and user friendly. My husband has just made me a new shelf out of recycled Rimu timber to go above the bench where the jug is. It will house our tea and coffee supplies and the teacups – all within easy reach. Thank you for letting me share this little snippet of my life." Everyone knows where Sydney is. This is a Sydney kitchen and it's part of Cath's home. "If you were to come to my house for a cuppa this is what you’d see of the kitchen from the lounge/dining area. We’re in a rental so I’ve done my best to make each room welcoming and comfortable without major changes, although we did receive permission to take the solid-core door off it’s hinges as it opened back onto the only set of drawers. Bad design there! The small café table was in the garden when we arrived, but after a clean up and the addition of a couple of folding chairs it’s the perfect place for breakfast or a cuppa with a friend while chatting and cooking. On my windowsill I have my Monet mosaic, a fresh gardenia, a little French jug I found at the op-shop, a candle, a thrifted hand-engraved wooden box, and some very happy herbs. Through the window you can see natives and tall firs backed by peak hour trucks and cars, as we’re on a major road. This is the area of the kitchen our family of five love the most – it’s where the cooking action happens! Around to the right are the wall oven and fridge. The painting on the wall is by a differently-abled artist from a local studio. My teapot collection and some gifted wooden frames add more interest to an otherwise dull room. The cooking utensils are in a jug that’s a big sister to the one on the windowsill, and the measuring cups and spoons are in the thrifted red and white cake box. The storage space is fantastic and I’ve been able to organise the contents of each cupboard according to how close they are to the stove, oven, or sink. This is my favourite kitchen out of all the houses we’ve rented. It’s light, bright, and large enough to have a café inside. 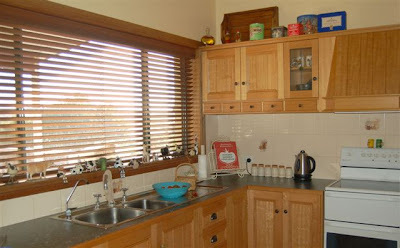 :) "
Today's we have another Australian kitchen. This is Anita's kitchen in Victoria..
"My kitchen has become a much more important part of my life since I returned to being full-time a stay at home Mum almost 2 years ago. I developed a chronic illness (fibromyalgia) 3 1/2 years ago which eventually made me unable to continue my job as a nurse. In many ways this challenging time has also been a blessing. I have returned "home" and we are a much better family for it. While I'm no domestic goddess, I'm working on it every day. This kitchen is the hub of activity here. I am trying to focus on my health which means preparing healthy meals from scratch as often as possible. Sometimes we fall off the wagon, but we always manage to get back on track. I love that our kitchen has signs of our family life - kids lunch boxes on the windowsill, waiting to be filled tomorrow morning; a fridge covered in kids artwork and notices from school and sport; even two silly "pet aliens" on the windowsill which the boys got for their birthdays from friends. On the bench is the second-hand breadmaker I recently bought on ebay, so that we can enjoy healthier home-baked bread. I'm not up to kneading by hand due to pain in my arms, shoulders and hands at times, so the breadmaker is a great help. Always present on my kitchen sink is a handknitted dishcloth or two. My health is slowly improving but I'm not in a great hurry to return to paid work if we can manage on one income for a bit longer. I cherish being home for my two boys, aged 8 and 6, and my hubby too. Thanks for visiting my kitchen :)" You can visit Anita's blog here. Today we return to north America, this time to Nova Scotia in Canada, to Sheila's kitchen. There is a reference to the weather in Sheila's story so I'll let you know she sent these photos in mid February. 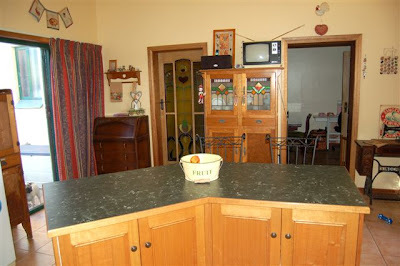 "I have attached pictures of my kitchen for you , We built this house about 5 years ago and I really wanted a nice island to work from and I must say it is a pleasure to work here. I have plenty of space and love to bake and cook and so does our 18year old grandson . As you can see we have an open concept house, this actually extends right into the living room. According to bizymoms.com, I'm one of the five top home and garden bloggers. They interviewed me recently and here is that interview. If you have time, read the other interviews too. The lovely Melinda from One Green Generation is there as well. Thanks Bizymoms. Today's kitchen is Tanya's in beautiful Tasmania - the island State at the bottom of Australia. Tanya, I have the same Fowlers Vacola and we have very similar kitchen cupboards. "I took these photos at dawn hoping not to have too much light exposure but they are still flooded. Through every season, the sun comes streaming through that window and I have never had any curtains or blinds on it because I love to look out on the garden and the chickens. 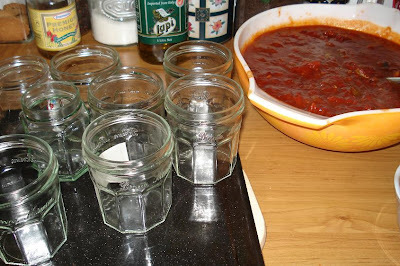 Last night I bottled some tomatoes and some beans so when I came out this morning after my husband, he had taken the cooled bottles and placed them on a tea towel and up ended to Fowlers Vacola Pot (1950’s version) on the sink to dry. On the sill above the sink I keep a bottle of hand wash and a great narrow vase that fits here just right and often holds bunches of herbs from the garden. The white ceramic pot near the sink is my compost bin for the chook scraps. It is one of my favourite things because it is just the right size for daily scraps, cleans up so easily and has a handle for carrying and also a lid with airing holes and a carbon filter. At this time of year there is always an overflowing colander of tomatoes. Beside those I also have some Australian Limes that were swapped for some eggs and I have been making Blueberry Jam with Lime and Coriander (crushed seed not leaf), a beautiful combination. Another great “couldn’t do without” is my table in the middle of the kitchen. It is an old Singer sewing machine base with a marble slab on top. This is where I make pasta, knead dough and do a lot of food prep. My blog can be found at www.suburbanjubilee.blogspot.com"
One of the things I love about this series is the kitchens come from all over the world. We can see real kitchens and know that although we are different, we are all basically the same. Today's kitchen is Marian's in the Netherlands. "I send you pictures of both my kitchens. In my home in Amsterdam my 20 years old kitchen is most of the time tidy without things on the sink. That's because I learned my family to clean up after using the kitchen. In that way I function the best I can with a fulltime job as a teacher and three grown up children (17, 19 and 21 years old) We have a dishwasher but we have to wash a lot by hand too. The picture of the other kitchen is from my allotment. It's 15 minutes on our bike from our city appartment to reach it. We have a nice garden and a wooden house 26m2 that's made by hand by my husband and his father about 30 years ago. There's no electricity in the cottage but we use a small solarsystem for the lights. In spring and summertime we live in our cottage and enjoy the outdoorlife still close by Amsterdam. I have two weblogs, both in Dutch, http://www.vuurvlindertje.web-log.nl is about my daily life and the things I like to make. I just started the other blog http://www.lifeandco.web-log.nl and I will use it to write about our allotment and about our first steps to simple living. We already started baking our own bread, we make our own granola, we are growing our own vegetables. I'm a teacher of textiles and crafts so I can repair and make a lot. It's nice to see how our tiny steps we make to a more simple way of living awakens the thoughts of our children about the way that life is constructed. It gives us all a sort of new consciousness about our lifestyle. 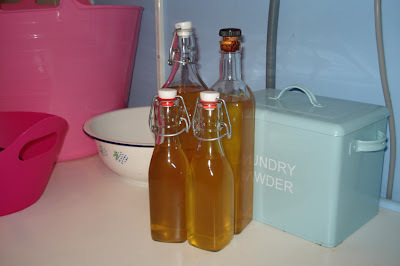 I made another batch of liquid soap last week and I found the process much easier this time. My first attempt last September was a long, drawn out process that went over two days and while I was doing it, I felt it wasn't working out properly and all that time would be wasted. 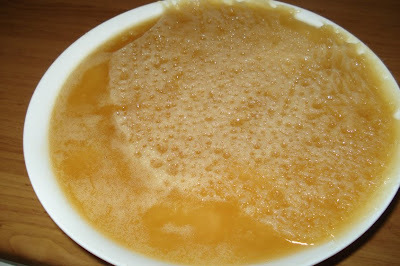 You can imagine my surprise when from the blobs of what looked like vaseline, a clean and golden liquid soap arose. I used that soap and loved it, however, I have to tell you that unless you're really into soap making or simplifying your life in every way you can, this is probably not a project you'll be interested in. This soap is really the liquid version of my plain soap - everything you use this liquid soap for, would be just as easily served by using homemade bar soap. Of course, it won't be a rich golden colour, but the results will be the same. Similar to the bar soap it is not stripped of glycerine like commercial soaps are and it feels really restorative on your skin. Both bar and liquid can be used for washing dishes and hands, stain removal, shampoo, horticultural soap, washing the floor and anything else you can think of. If you want to get rid of detergents, this is the soap for you, but it doesn't have to be the liquid version, the bar soap would work as well. I used this link the first time I made this soap and found it confused in places, although it does contain a lot of information and a good recipe. Where this soap comes into it's own is as a lovely addition to a gift basket. If you want to make up baskets of assorted soaps, or all purpose cleaning baskets as gifts, the liquid soap would be a wonderful addition. It is also much cheaper to make your own soap - bar or liquid - than it is to buy them, and it will allow you to ditch the detergents you're probably using now, which also includes the plastic bottles they come in. Making this soap does take a long time from start to finish, but most of that time you're not doing anything, you're waiting for the soap to get to the next stage. I guess the amount of time you're actually working on the soap would be about 30 minutes. 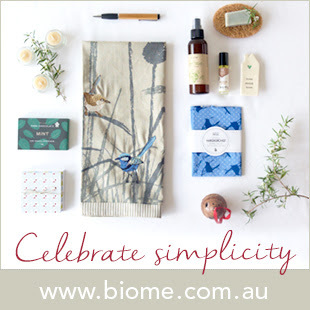 So if you're wanting to cast off plastics and detergents, or working on your gifts, give it a try. And this, my friends, will be my last post for a while. I'm taking a break to slow down and look for meaning in my life. I have books to read, recipes to try and many things to think about, as well as a lot of projects I want to work on. I need moments of solitude, I need to shut the gate for a while and I need to shake things up to see what comes back to me when the dust settles. Be kind to yourself while I'm gone. I'll see you soon. Hello everyone! Today we can all take a peek at Kit's kitchen in Missoula, Montana. "My kitchen is very small! 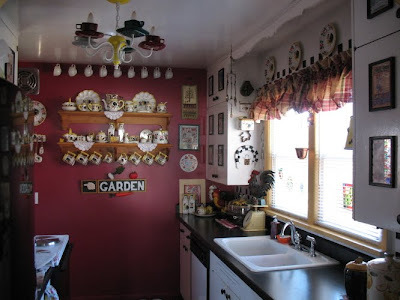 What one would call a galley kitchen, but I find it is very efficient and I really don't have to move very much to get what I want....lol The deciding factor in the colors of my kitchen is the pottery I have collected for years, it is called Rooster and Roses and was something my mother had when I was a little girl. I only have one original piece from that collection (the lamp on the cupboard) and so have started my own. I also have always loved the bold colors and design, of my favorite artist Mary Engelbreit and have added lots of her illustrations and unusual items like my homemade tea cup lamp and black and white checkerboard to liven things up a bit. 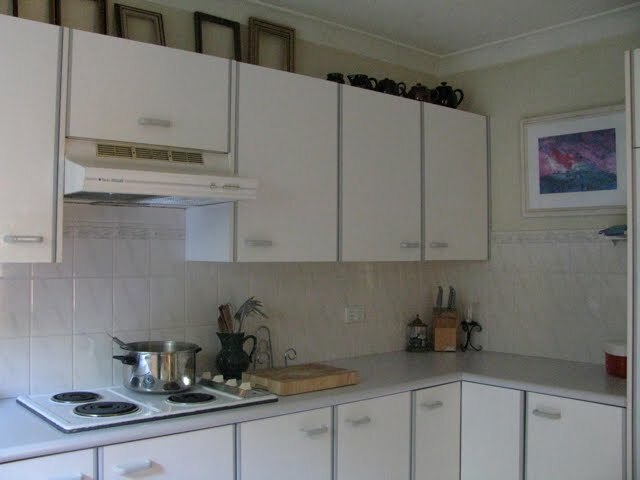 My home is 60 years old and the cupboards are original and I have never touched the white paint. I love the patina and "look" of so many hands having touched them. There are even little notes attached from the first owners that are so precious to me (on the inside). I hope you enjoy it as much as I do!" I've been thinking about this for a while, and I don't do it lightly, but after Friday's post, I'll be taking a break from blogging for a while. I'm not sure how long I'll be away, maybe a week, maybe a month, maybe longer. I don't know yet. I have a few other things on my plate right now and along with my voluntary work, I'll be kept busy. And the truth is I've been non stop busy for well over a year. I want to take time out for myself, for Hanno and for my family. I need to dive right into my home again and reacquaint myself with the ins and outs of it. I've barely had a chance to do that for these past few months and I miss it. I am not stopping my blog, I actually enjoy blogging, and when I get up in the dark every morning and make my way to the computer, thinking about my days so I can write about them, it helps me account, in my own mind, for these hours I've been given. It helps me live simply. So for the next few weeks I hope you'll be patient with me, know that I'll be back with you as soon as I can be and that I look forward to the morning when I make my way, in the dark, to the computer again. 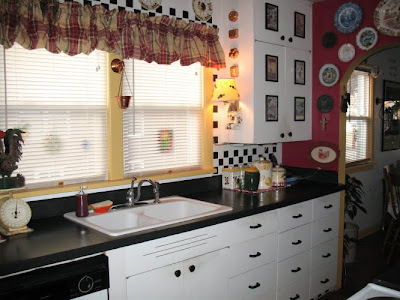 I'll be at the Down to Earth forum and will continue posting three kitchen sinks per week. I hope you continue to enjoy them as much as I do. Thank you to everyone who has sent in photos and to all the readers whose wonderful comments have kept me going. See you again on Friday. Carrying on from the post on sowing seeds yesterday, I'd like to add the following vital information. While the seed is still covered with soil, it does not need anything other than moisture and warmth to make it grow. However, when the seed germinates and sends up green shoots, it will need bright light as well. When it gets a little bigger, the plant will need food; the energy in the seed will be exhausted. Then you should start your fertilising schedule. 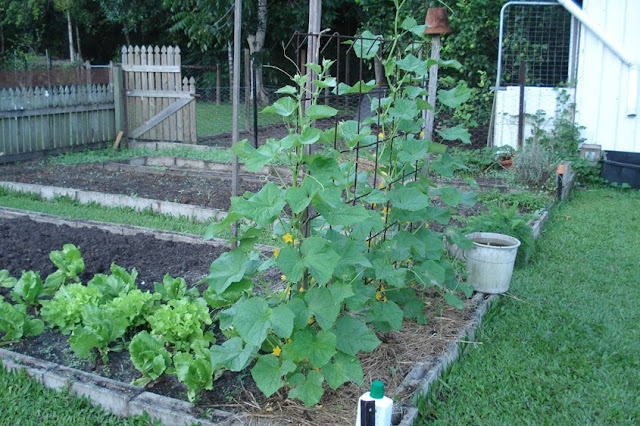 When you plant the seedlings out, there should be abundant food in the soil in the form of compost, manures and castings, or whatever it is you've decided to use on your plants. That should be in the soil. While the seedling is still in the tray, you'll need to feed it - there is very little nutrient in seed raising mix, sand or vermiculite. The ultimate prize - homemade tomato relish. We only ever use organic fertilisers here - either bought from the nursery or homemade. Generally when our seedlings are still in their trays, we fertilise them with weak fish emulsion, weak liquid blood and bone OR weak comfrey or worm tea (homemade). Not all of them, choose one. Comfrey or worm tea is an excellent choice for both leafy green vegies and for fruiting ones, like cucumbers and capsicums/peppers. Fish emulsion and liquid blood and bone will put on healthy growth on your green leafy vegetables. I never go by the container recommendations on the fertiliser, I make up a 50% solution and apply it twice as often. For instance, if your fertiliser instructions recommend making up a 10 litre/quart watering can with two caps of fertiliser concentrate and apply it fortnightly, I would make up a watering can with one cap full of concentrate and apply it weekly. 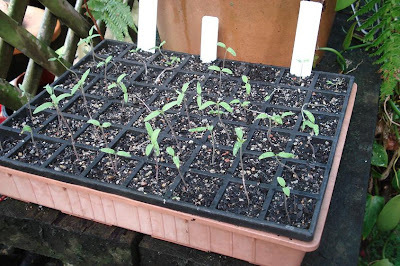 A tray of tomato seedlings, newly emerged. At this stage they need no fertiliser but strong light. Enough light so a shadow is cast. So, now on to tomatoes. Forget what I said above about fertilisers, tomatoes are different. I picked up this way of growing tomatoes from Peter Cundall, surely Australia's master vegetable gardener. I plant the seeds as normal and wait for germination. 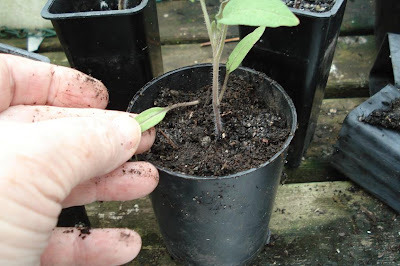 When the plant has grown to be about two inches above the top of the soil, I transplant it to a slightly bigger pot, fertilising with comfrey and a pinch of sulphate of potash (it's organic). Each time I transplant, I also water the plants with seaweed tea - this helps significantly with translpant shock. I wait again and when it grows another inch or two, I transplant it again to a larger pot - each time I remove the bottom leaves and bury the plant deep, and water with seaweed tea You can do this with very few plants, it would kill most of them. But tomatoes have the ability to produce more roots along their main stem and the more roots you have on a tomatoes, if you grow a healthy plant, the more fruit it will produce. Tomatoes also like being slightly root bound. When they're a little bigger, transplant to a larger pot. 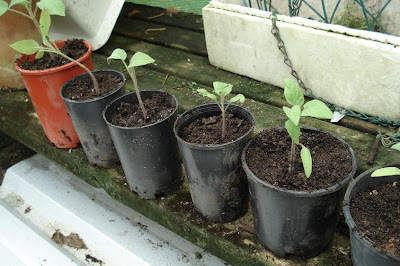 You keep your tomatoes seedlings going like this until they're strong and healthy and when they flower, you plant them in the garden - again, deep in the soil into which a pinch of sulphate of potash has been added. You might even bury half the stem and have the top half of the tomatoes about the soil. Put the stakes in before you plant the seedlings so you don't damage the roots by doing it later. If the plant is big enough, tie it to the stake straight away. Remove any axis shoots because if you allow them to grow, they'll make a very bushy plant and you'll get fewer tomatoes. When you transplant again to a larger pot, pinch or cut off the lower leaves. 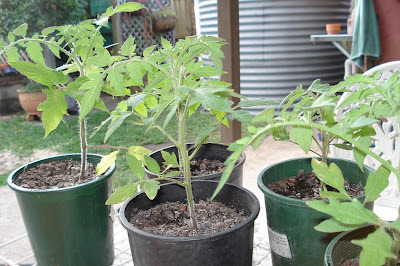 Once you've planted the tomatoes out and tied them to their stakes, mulch heavily with straw or hay, packing it in around the stem and up about three inches. Again, most plants would hate this but tomatoes thrive with this treatment. Water the mulch well without watering the tomatoes leaves. Always water tomatoes from below, never over the top of the plant. Splashing mud onto leaves with the hose will encourage disease. If you mulch well, the tomatoes will send more roots out into the mulch. Do not over fertilise tomatoes with nitrogen, it will make the bush grow like mad but you'll get almost no tomatoes. Make sure you keep staking and keep the branches off the ground. When the tomatoes are big enough, pick them still green, and ripen them in the house, out of the sun. They will develop their full flavour that way and be out of harm's way. All the while, they'll need strong light while being protected from the harsh weather. Tomatoes suffer from a disease called blossom end rot which is caused by inconsistent watering, resulting in a lack of calcium in the plants. You'll see a big circle that runs around the blossom end of the fruit. To avoid this, set up a watering schedule so your plants get consistent watering and don't suffer periods of dry. When they're at this size and start flowering, plant them in the garden. So, my friends, that's one of many ways of growing tomatoes. I'm sure you won't be disappointed if you try it. Just think of all those delicious tomato sandwiches and jars of tomato relish standing like jewels in your cupboard. Mmmmm. If you're growing heirlooms this year, don't forget to keep your very best tomato to save seeds from. Yes, I know it's a huge sacrifice to save THE best, but you want to pass on THE best seeds. 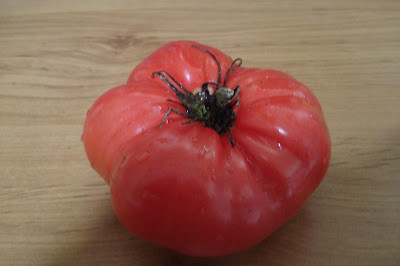 In my opinion the best tomato for flavour - the pink Brandywine. If I were a betting woman, which I'm not, I'd bet that almost all our gardeners here would be growing tomatoes at some times during the season. Who will be growing tomatoes and what varieties are you growing? We've been slowed down by the rain but it's not stopped us, nothing can. We're now in our planting season, getting our new season garden going for the year ahead, and seeds need to be planted. Hanno started this season off by enriching the soil with cow manure, worm castings and compost. He does it every year and often between crops as well by digging out a hole and replacing the soil with a rich mix of compost and aged manure. In the world of the vegetable seedling, nothing helps them more than good soil. If you're gardening for the first time this year, or the hundredth, that is your starting point. There are many seeds you can plant straight into the soil, but others benefit from being grown in a container in sheltered conditions, and then being planted as a seedling. The main one of these is the tomato. You will get more tomatoes if you plant them as seedlings and I'll show you how to do that later. Root vegetables like carrots, radishes, parsnips, turnips and legumes - peas and beans, are best planted directed into the soil. For the rest of your seeds, be guided by the instructions on the seed packet and if you're an experienced gardener, by your own experience. We prefer to raise lettuce, capsicum, cabbage, leek, cucumber and celery seeds in trays and plant them out when they're ready. We over-plant seeds so we can choose the strongest looking seedling and discard the weak ones. If you want a very orderly garden, you'll benefit from planting seedlings rather than seeds in the garden because with seeds you either over or under plant, and some seeds don't germinate and you're left with an empty space. Planting from a seedling tray will allow you to plant out the garden exactly to your liking. 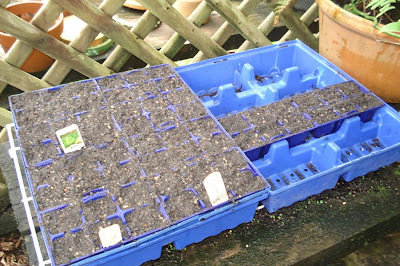 When planting seeds in trays, use a good quality potting mix, not potting or garden soil. You need a mix that is open and drains perfectly, with no lumps of bark or charcoal that will stop a tiny seedling from emerging. 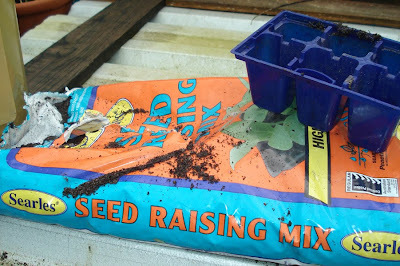 It's quite easy to make your own seed raising mix, but I prefer to buy mine already made. 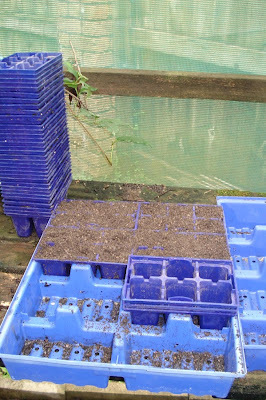 Fill the trays, poke your finger into each cell to flatten the soil slightly, then top up the cell with the mix again. Plant according to the instructions on the packet. Generally, the rule of thumb is the larger the seed the deeper it's planted. 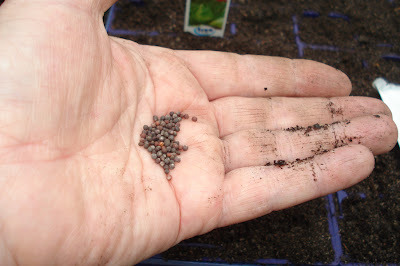 So for a seed that is tiny, you'd only have to place them on the top of the soil and scatter seed rasing mix over the top to cover them and pat down. For a larger seed, plant it at twice its size - so a seed that is ½ mm would be planted 1 mm deep and a 1 mm seed would be planted 2mm deep. Pat the soil down over the top so the seed stays where it is planted, then gently water in. Don't do that with the hose, it's too forceful, get yourself a plastic spray bottle and use that. It will take a while to completely wet the soil, but that's what it takes - gardening will help you slow down. The seed and all the soil in the cell needs to be saturated, and then the water should freely drain away, leaving a moist seed and cell. The water is what causes the seed to germinate. Once the tray has been planted up, you must keep it moist. 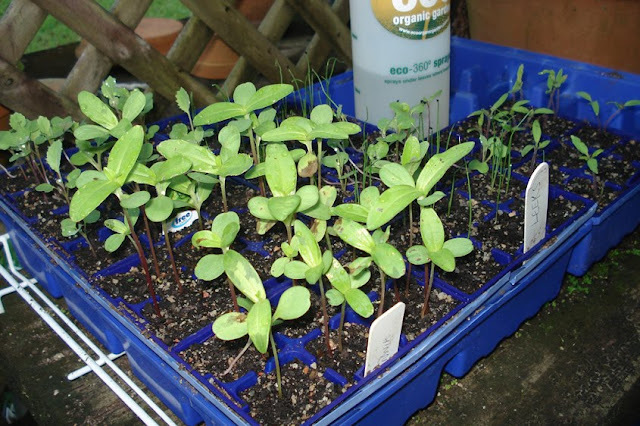 Seedlings don't cope well if you let them dry out. Give them a good spray of water every day. Seeds contain everything, except water, to make them grow, they don't need fertiliser. Once the true leaves appear, you can gently fertilise them, but not before. If you're using new seeds, you should be fine as long as you checked the use by date on them. If you're using older seeds that you've had for a while, or those given to you by a friend or seed swapper. you can test them for viability before you plant them to make sure they'll germinate. I wrote about how to do that two years ago, here. If you plant by the moon, and that really does work and make sense, there are moon phase calendars to be guided by, just google "moon phases London" or wherever you are and you'll find a moon calendar to help with your planting. In Australia, the planting time for March will start next week with the new moon on Monday 15 March. Here is a moon planting guide. When planting seeds directly into the garden, most seeds can be planted, in dry soil, watered in and then left to be watered again each day until the seedling emerges. The seeds of legumes need to be treated a bit differently. When planting peas or beans, water the ground well before you plant the seeds. Then, planting according to the spacing on the seed packet, place the seeds into the moist soil. Don't water again until you see the new shoot emerge. When you plant as many seeds as you need and have some left over, most seeds can be kept for another time. Wrap them up again in the packaging they came in, making sure they can't fall from their packets, and put them in a glass jar - recycled of course - and put the jar in the fridge. Seeds stored in the way will last a few years. 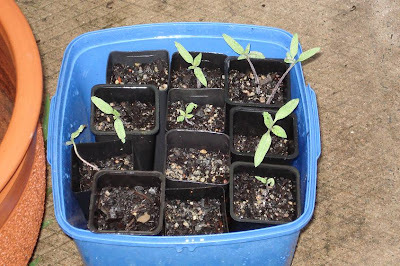 This post is getting too long so I'll write about tomato seeds and seedlings tomorrow. We all still have a week before we need to plant according to the moon. 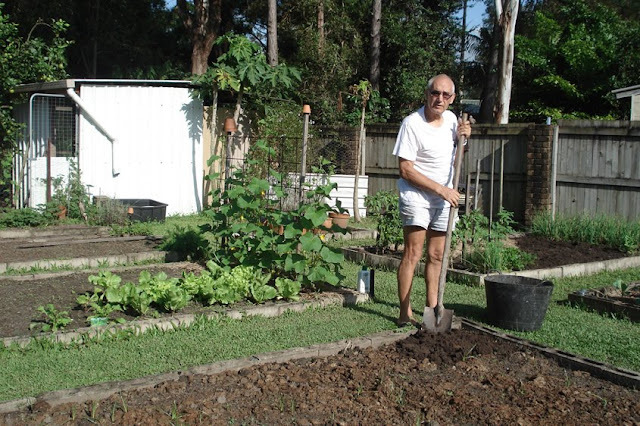 I have a very good Australian gardening book by Lyn Bagnell what speaks of moon planting. If you can get a copy, it's worth the read. I believe Lyn's book to be the best Australian vegetable gardening book. Lyn has her own informative blog as well, you can find her here. This week will be an excellent time to plan, collect and prepare your seeds. If you're a new gardener, it would be a good idea for you to draw a garden plan. Don't be too ambitious in your first year - there is hard work ahead. We mindful of the time you have and don't make the task to difficult for yourself. Gardening can be a wonderful and creative use of your time, but overdoing it will make you resent the first time you picked up a spade. Even without the overcast sky I think it would have been cooler this weekend. We've passed through the time when hot turns to warm and now we're getting closer to when warm becomes cool. Perfect! I want it to be March and April all year. Hanno and I had a traditional, for us, Sunday. He ventured out to the wet and squelchy garden to put up trellises for the cucumbers, I baked and did some sewing. All in all it was a lovely day. 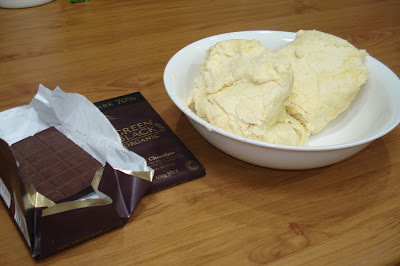 I had been meaning to use up some of the delicious chocolate the people at Green and Black sent me before Christmas. I'd already given some to Shane and Kerry, and made some chocolate mousse, then forgot to take photos of it. 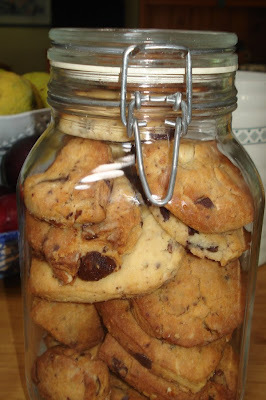 Yesterday, in my celebration of quiet domestic Australian Sunday, I made choc chip biscuits. It was an easy task because I already had the cookie dough made and frozen, all I had to do was defrost and chop. 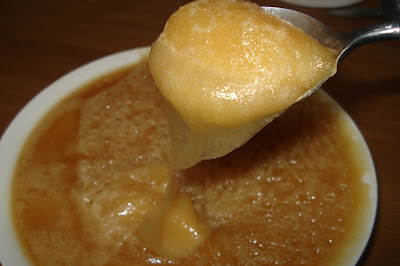 1 can condensed milk (390-400 gram) - my homemade condensed milk recipe is here. 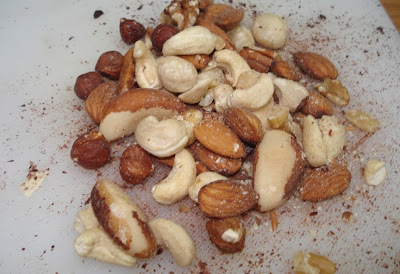 With the dough already in hand, it was simply a matter of chopping the chocolate - I used the deliciously bitter sweet 70 percent dark chocolate with a small hand full of mixed nuts - brazils, hazels, almonds, cashews, macadamias. Mixed together and flattened out with my hands on the kitchen bench, it only took a few minutes and they were in the oven. 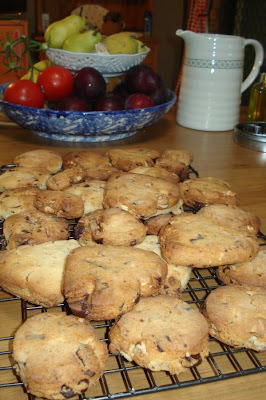 Ten minutes later the house filled with the aroma of freshly made biscuits and Sunday was smelling the way it should smell. 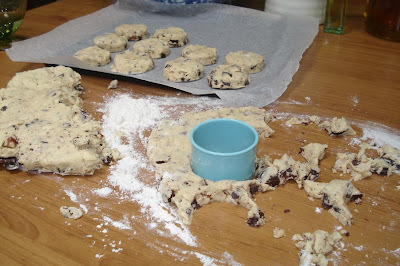 There are two aromas that make a real domestic Sunday - baking biscuits or cake and roasting meat. We had roast chicken for dinner. 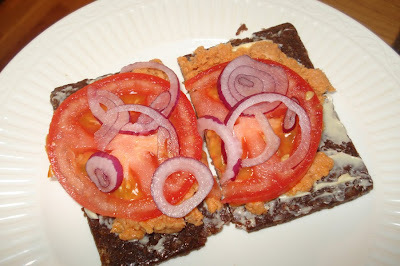 Lunch was a tuna, tomato and onion pumpernickel sandwich and a still warm from the oven biscuit and black tea. Delicious! Just after lunch, I planted some vegetable seeds and looked around my bush house where I put sick plants to recover, grow my orchids, and keep new seedlings. There has been so much rain, moss is growing on the benches and all my watering containers were full of rain water. Not that I needed to use them with the plants still saturated and growing wildly. It was a real treat to be surrounded by new growth and the promise of new life. So many things are made possible with abundant water. I checked all the water containers and found cane toad tadpoles in one so I tipped them out and made a mental note to return before the week was up to use the water before mosquitoes have the chance to hatch. This year has been the worst one yet for mosquitoes. All in all it was a lazy day with things being done when I felt like doing them. The bed was made in the afternoon when I started to think about sleeping in an unmade bed, no floors were swept and the laundry stayed unwashed for another day. In the afternoon, while the chicken started roasting, we watched a documentary about happiness. Bliss! I hope you enjoyed your weekend and that the week ahead is a productive and rewarding one for all of us. 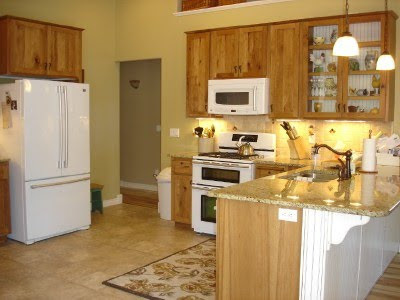 "Enclosed are a few pictures of my kitchen. We built our home from the ground up and moved into it three years ago. It was a giant undertaking but worth the effort in the end. 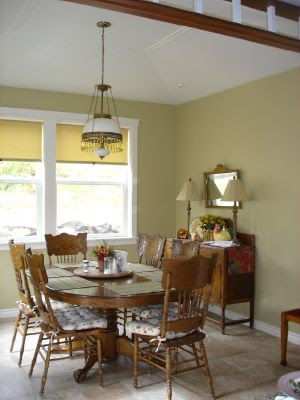 Our kitchen is open to the great room and includes a dining area; all of which are the 'hub' of our home. The built in spice cabinet is actually a vintage ironing board cupboard that I refurbished with paint, new hardware, and glass shelves. 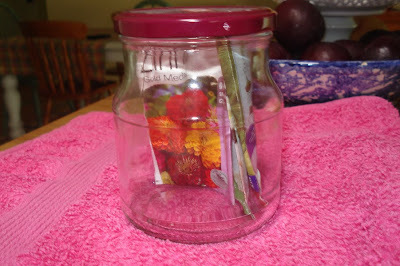 It's perfect for storing large jars by freeing up valuable pantry/cupboard space, all the while keeping the spices cool. Living in North Idaho, USA, we often have moose and other wild game to view while we enjoy our meals at the kitchen table. Keeping the critters out of my garden is a non-stop effort! " "We built this kitchen onto our house around 7 years ago. I designed it and I love it probably more today than I did back then. On my sink is my first knitted dishcloth (I am the world's slowest knitter) and the produce plucked from our garden this morning; chillies and heirloom tomatoes to go into pasta sauce and a basket full of eggs that my daughter takes up to the chook house every day. My collection of cows sit happily above the sink as a reminder of where I grew up on a dairy farm. We do not have a dishwasher, I love to do the dishes by hand looking out over parkland and tree tops as we live high on a hill. I use our island bench for all of my chopping, mixing etc. From this view I get to see who is running up the passage-way and in the dining come sewing room, my vintage and antique furniture (the meatsafe on the left is from the late 1800's), and my beautiful puppy Heidi the Pug. What you can't see in the photo is Sophie's handmade wooden kitchen sink and oven behind the bench, so we really have 2 sinks in our kitchen. Our kitchen is definately the heart of our home, there's always someone in it ready for a chat. This room makes me smile and I am always comfortable and happy here. I have 2 blogs, the first being for all of my crafty obsessions at www.suejoy.blogspot.com and for health, home and garden, www.sue-brown.blogspot.com"
If I could, I would send all of you the magic words that would change your life to what you wish it to be. I don't have those magic powers, all I can do is write what I know and hope that the way you understand those words helps you towards a better life. The best I can do today is to say: slow down. I received an email from a reader saying that she wanted the kind of life I'm living but doesn't know how to go about it. I wrote back to ask if she'd read the 2007 parts of the blog where I write about budgeting, paying down debt, housework, gardening, slowing down and being at home. That explains how I came to this life and the closest thing I've written to the kind of guide she was looking for. She wrote back asking if I could condense it for her. Everyone who reads here can take what they need from what I write, but what I hope everyone gets is that we all have to take the time to slow down and at every opportunity, add value to our day. 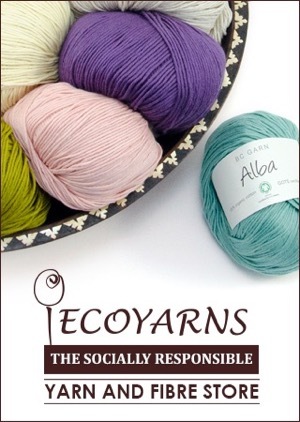 I add value to my hours by knitting, gardening, reading, sitting, talking, listening, watching and being still. 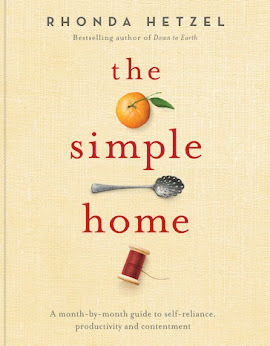 We can all carry out the tasks of a simple home and live a more simple life by cooking from scratch, sewing and mending, making green cleaners, baking and gardening. That's the easy bit, although it takes persistence and the energy to do it every day. The more difficult bit is to connect the dots and to make those simple tasks mean something to you so you enjoy doing those tasks on a daily basis. The way I do that is to slow down, think about why I'm working in a particular way and to consciously enjoy what I'm doing. Sewing isn't just sewing, cooking isn't just combining ingredients in a pan, I think about why I'm sewing, who I'm sewing for and how I can make it special, not just for them but for me too. I feel the fabric, admire the colour combinations and take my time. I don't want to rush anything. I want the act of sewing to add value to my day. 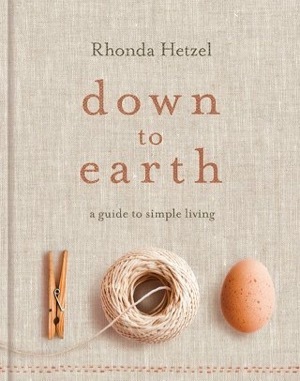 There are no condensed versions of a slower and simpler life. You have to live the full measure of it. It is a life long process - a journey with no end. If you look for short cuts you will short change yourself because the point is not to get to the end fast or with more chickens or loaves of bread baked, it's to enjoy the journey. Hello everyone! Today's kitchen belongs to Jen who lives in Michigan. She has added a nice touch that I've never seen in any other kitchen. Well done, Jen! 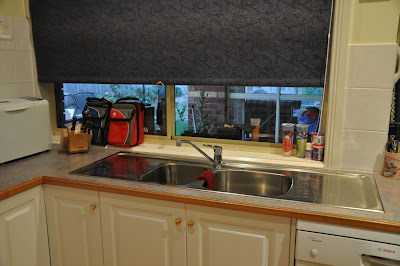 "I'm really excited to share my photos as we recently did a little fixing up of our kitchen. Ours is a small space, about 9'x11', so it is difficult to get good pictures of it, but I hope these will work for you. 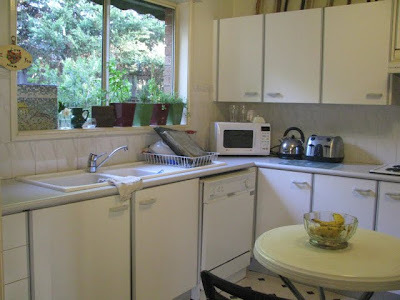 The first picture shows the kitchen sink, and the main part of the kitchen. 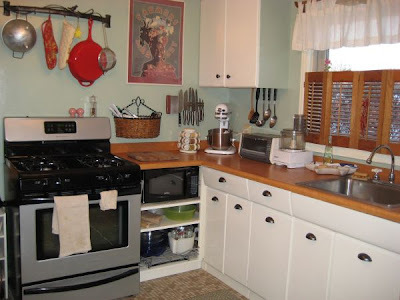 The cabinets in this area are original to the house (1950's) and are metal. I love them. With so little storage space, many of my cooking utensils are out in the open and easy to grab. The red skillet hanging above the stove is cast iron. I am just learning to cook with cast iron. The cabinets and countertop next to the refrigerator are new; we installed them ourselves. 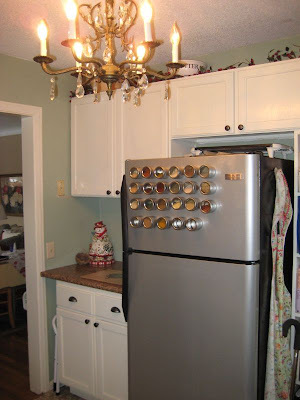 Unfortunately, it was impossible to find metal cabinets to match the originals. These were stock, unfinished cabinets from Home Depot and I painted them the same color as the old ones and hope they blend OK. We used to have open shelving in this area and it was difficult to keep things looking neat. I am happy that things are contained now and that I have a bit more counterspace. We were unable to match the cabinet hardware on our old cabinets, so we decided to upgrade all the cabinet hardware so it would match. I love the new knobs and pulls - it is surprising how it modernized and pulled the space together. The magnetic spice containers on the fridge were a Christmas gift and allowed me to free up a lot of space in one of my cabinets - important in such a small kitchen. You can see my apron hanging on the side of the fridge. You can also see from the picture that yes, I have a chandelier in my kitchen. :) I think it is a fun and unexpected addition to a hard-working space." When the weather is cooler, knitters knit.